Welcome sweet friends to day 6 of 12 Days of Christmas Decorating. Wowie I made it to the halfway mark. Now let’s see if I can take it to the finish line……. Yesterday I showed you three ever-so-easy vignettes that even the busiest decorator can create. Today I am showing you another one. 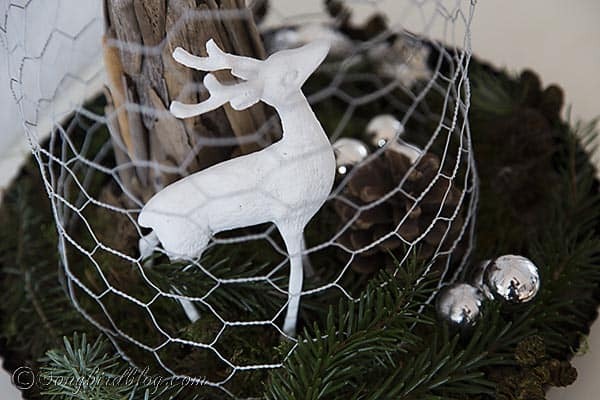 A nature inspired rustic Christmas decoration. 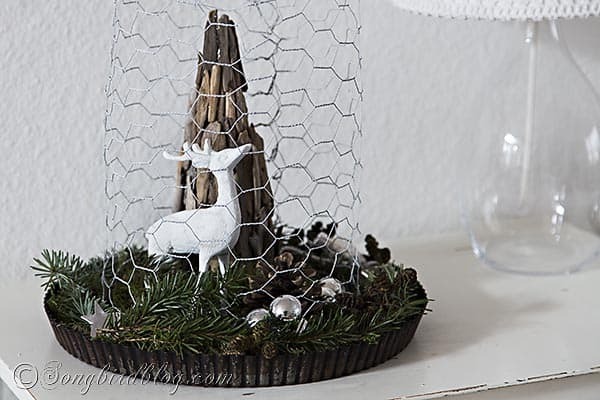 A little deer with a driftwood tree under a cloche on my mom’s baking tin….. I think this one is my favorite of the bunch. There is something so sweet about it, and it contains so many elements that I love. I made the cloche eons ago, it appeared on my blog first in a little Spring vignette and then it was the industrial element in a little industrial coastal cottage vignette. It is so easy to make that I don’t even know why I hung onto it for so long. I could have whipped up a new one in minutes. Wrap chicken wire around a vase, bucket or whatever that is round and the width of your desired cloche. Cut it with pliers and wrap the ends together (wear gloves those pointy ends are lethal). Now fold and mold the top into a dome, wrap the ends together and cut of the excess. That’s it. Told you it was easy. My little deer is in the company of a driftwood Christmas tree. This one required more than a few minutes, but not a whole lot more and it was quite relaxing to make. This is how I did it. Supplies: a cone, a bag of small driftwood pieces and a hot glue gun. You can use a styrofoam cone if you have one. I didn’t, it was night I wanted to make my tree NOW and besides those styrofoam things are ridiculously expensive. So I made my own cone. I used a leftover bit of floor covering. It is the kind of paper you buy on large rolls in the paint shop, it is slightly plastified and protects your floor like nothing else when doing some heavy-duty makeover activities. We have had a role for years and the paper has been used many times. I am running out now, this was a bit of the last bit left. So I used it, paint splatters and all. You can use any kind of strong paper, cardboard or carton that is strong enough and still bendable enough to roll. So make a cone by rolling up a piece of strong paper and cutting the bottom until you have a cone that is standing straight. As you can see I grabbed some paint tape to make to cone stay in shape. It doesn’t matter how the cone looks, you won’t be seeing it anyway. Hot glue the pieces of wood on, until you can see no more paper. That’s it! Sorry there is no more science to this. The deer used to be brass and I brought it home with me after we cleared out my in-laws house. Back then I painted it white and glittered it. It was the star in a vintage Christmas vignette up in my craft room. Since then it was hidden away in the Christmas boxes. I set it free. I washed off most of the glitter and the repainted her with some chalk paint. She is now fresh and white and ready for a new round. I love my little deer vignette. I hope you like it too. Are you having fun with this series? Isn’t everybody doing a stellar job? You can see all of our efforts combined on our Pinterest board. I absolutely love this. My daughter loves chickens and went deer hunting for the first time this year. It would be great if I could make this!!! I never liked working with chicken wire when it was for chickens so I’m very impressed you made a cloche out of it!!! How did you shape it so very perfectly? Skill. Pure skill!!! You’ve had such neat ideas this year. Love them all. Stay warm!! !